The Independent Group of MPs has unanimously elected former Labour MP Gavin Shuker as their "convener" at the group's first meeting, but has not elected a leader. 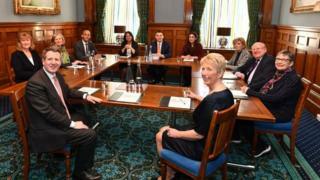 The eight former Labour MPs and three ex-Conservative MPs met in Westminster for the first time since resigning from their parties last week. The MPs said they had discussed the group's values and priorities. And ex-Conservative Anna Soubry said their top priority was Brexit. She said the 11 MPs will on Wednesday be supporting the Cooper-Letwin amendment - which aims to delay the UK's exit date from the EU by extending Article 50 if Theresa May fails to get her deal agreed by Parliament by 13 March. The government's handling of Brexit and Labour's Brexit stance were among the group's reasons for leaving their parties. The other Labour MPs who left the party last week were Mike Gapes, Chris Leslie, Angela Smith, Ann Coffey, Gavin Shuker, and Joan Ryan. Along with the party's Brexit stance, they also criticised the leadership's handling of anti-Semitism. Earlier, when asked if he wanted to lead the group, ex-Labour MP Chuka Umunna told the BBC's Victoria Derbyshire show: "I've said I would like to play the biggest role possible that I can put in all my energy. "We are all leaders. That is one of the things about our group, we think everybody's got a leadership role." Ian Austin became the ninth MP to quit Labour last week, blaming leader Jeremy Corbyn for "creating a culture of extremism and intolerance", but he has said he has no plans to join the Independent Group. Which Brexit amendments will be tabled? Jeremy Corbyn has said the Labour MPs who have quit the party should "resign and put themselves up for election". Mr Shuker worked for his local church before his election in 2010. The MP lost a vote of no confidence by 33 votes to three in his constituency party in September 2018. He then said he would remain as an MP, adding: "I've not changed - but the Labour Party has." Conservative MPs Anna Soubry, Heidi Allen and Sarah Wollaston followed the Labour resignations and joined the Independent Group. The three MPs blamed "a shift to the right" in their party and the government's "disastrous handling of Brexit" as reasons for their departure. Image caption Ex-Labour MP Luciana Berger said they would talk about "how we can make a difference to fix our broken politics"
When speaking about the group assigning roles to different MPs, Ms Soubry said she had "a strong bias towards my great mate Chuka" to be the group's leader. While Dr Wollaston told BBC Radio 4's The Westminster Hour: "I think we would all be very happy to see Chuka in that role, but we don't know over the coming days and weeks whether others will join us and somebody else may emerge. "But there's clearly an appetite from the public to know who's going to be our spokesperson and I think that's reasonable." Who are the MPs resigning to join the Independent Group?